The project aims to modernize Polotsk’s municipal lighting system by raising its energy efficiency and to encourage other Belarusian cities to achieve similar improvements. In the course of the project, more than 1000 modern lamps will be installed in Polotsk’s central streets. This should allow to decrease by more than 750 tons the amount of CO2 emissions Polotsk spews annually. And Polotsk’s Lighting Development Strategy will ensure further modernization until 2030. “In 2011, Polotsk was the first Belarusian city that joined the Covenant of Mayors, and therefore, became one of more than 6000 European cities aiming to reduce carbon dioxide emissions through cutting energy consumption and by switching to alternative energy resources. Energy efficient city lighting perfectly comports with these principles. This large-scale project should also give Polotsk residents stimuli to save electricity. Moreover, dozens of Belarusian cities will learn about the project and its results. Therefore, Polotsk will make a significant contribution to the sustainable development of Belarus,” – Sergei Leichenko, Deputy Chairman of Polotsk District Executive Committee. The Covenant of Mayors is the mainstream European movement, involving local and regional authorities, voluntarily committing to reduce CO2 emissions by 20% or more trough developing green economy and promoting higher standards of life. To realize this aim, a new signatory of the Covenant of Mayors must prepare its own Sustainable Energy Action Plan. Polotsk finalized such a plan in 2012, thanks to the project SURE, which had been also funded by the European Union. The Polotsk Sustainable Energy Action Plan includes measures to increase energy efficiency of municipal buildings and enterprises, to generate more renewable energy, to widen urban green zones, to streamline the municipal public transportation. The PubLiCity project should also enable Polotsk to live up to the commitment it made in accordance with the Covenant of Mayors principles. 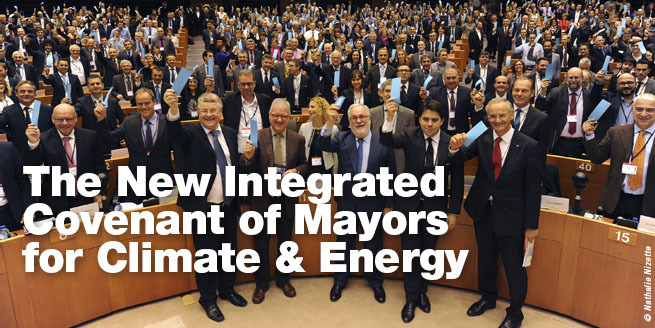 Today, the initiative has the new name — Covenant of Mayors for Climate and Energy. New aims were brought with the new name: earlier, the Covenant signatories were striving to reduce carbon dioxide emissions by 20% by 2020, and now, they are aiming at more ambitious and lofty 40% (that shoud be achieved until 2030, however). In 2019, 1340 energy efficient lamps will be working in the city's major. At the same time, in 63% of the city’s streets, lighting will be optimized thanks to new 56 automatic light control boxes, having pre-installed GPS administration hardware. The project will also improve the decorative lighting in Polotsk, and therefore, make it a more comfortable and attractive city: around 40 Polotsk buildings and monuments will be lighted by new more economic lamps. Such improvements should enable Polotsk to reduce energy consumption by no less than 1600 MWh (around 15%) and reach a reduce in carbon dioxide emissions of more than 750 tons, compared to the respective levels of 2010. The ultimate project’s results will be determined through a special energy audit. This document will contain energy efficient measures how to improve lighting in 40 Polotsk streets, develop a conception of Polotsk’s decorative lighting, and a financial strategy for the actions. Polotsk residents, civic associations, and entrepreneurs will have the opportunity to improve and amend the development strategy for the municipal lighting. They will be able to submit their suggestions about the city’s lighting system during open public deliberations. Furthermore, the city will conduct two opinion polls on Polotsk residents’ satisfaction with the lighting. The project’s major results will be summarized for a separate case study. More than 500 copies of this case study and practical recommendations on how to streamline municipal lighting systems will be disseminated to Belarusian local governments. 40 specialists from various Belarusian municipalities and municipal services agencies will participate in a study visit to Polotsk. In addition, Polotsk will host a special forum for Belarusian signatories of the Covenant of Mayors and those cities that are on their way to join the initiative. By supporting “green” initiatives and changing everyday habits, urbanites can determine the level of energy their city consumes. Therefore, the project will introduce Local Energy Days in Polotsk within the framework of the European Sustainable Energy Week, festivals about energy efficiency in modern cities. Local Energy Days will feature exhibitions, conferences, study visits, and flash mobs about energy saving both at home and in the workplace. These events will be organized for Polotsk residents, representatives of Belarusian municipalities, entrepreneurs, and environmental NGOs. On May 28, 2016, the project was presented at the special event named Green Economy As a Belarusian cultural Code that was held right during Polotsk City Day. At the event, Polotsk residents could learn how Belarusian local governments, civil society organizations, businesses, and the European Union are cooperating together in order to bolster the development of green economy, a type of economy that reconciles growth and environmental preservation. The Polotsk Sustainable Energy Group will be coordinating the project. The Group already has members representing Polotsk's government and the city's communal services agencies. In the course of the project, it should expand thanks to representatives of the Vitebsk region’s authority and state organizations dealing with energy efficiency issues. To help Polotsk reach its Covenant of Mayors targets by enabling it to implement public lighting activities of the Polotsk Sustainable Energy Action Plan. To popularize the Covenant of Mayors and promote the principles of the Polotsk Sustainable Energy Action Plan in Belarus and the Eastern Partnership. Modernization of municipal lighting system in Polotsk. Decrease in carbon dioxide emissions in the city. Promotion of the principles of the Covenant of Mayors (especially those ones pertaining to municipal lighting) in Belarus.